Divine Feminine Piscean New Moon Collage Time! I am here with open eyes and an open heart. I deserve to have my dreams come to life. With the help of the moon’s power and my divine knowing self I will find and/or create images to help illustrate these dreams. This month I decided to create my collage the old fashioned way, by cutting and pasting and coloring. I printed out a recent painting to use as the background and then wrote in the names of all the native seedlings we are planting in our garden. 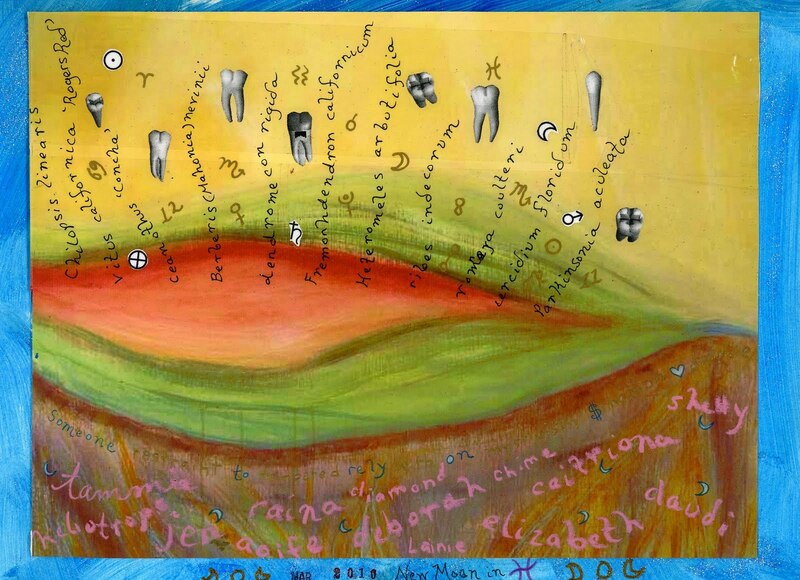 I added some teeth photos from a recent dental visit along with some astrology symbology plus some personal Piscean-related keywords and all the names of my Divine Feminine students! My intentions center around growing literal (plant) seedlings, helping my students grow in moon-wise ways, strengthening my own structural foundations and nourishing my divine feminine passionate wild woman nature. Collaging is a way for us to concretize our intentions through creative freeplay and 'play' is the keyword, this isn't meant to be hard work, or overly difficult, but instead it's a chance to invite our inner child out for playtime, to get messy, if we dare, and while we're at it let's do some digging into the gardens of our soul too! This Piscean New Moon re-connected me with a Jungian, archetypal study and analysis of my astrological chart. I have Saturn (the taskmaster) in the sign of Pisces in the 12th House (the Pisces House) along with Chiron, the wounded healer (and possibly the true ruler of Virgo which is my Sun Sign) so Pisces/Virgo is a major focal point of my chart and we all know how neat, tidy and organized Virgos can be, but add Saturn (more earth) and the mystical, artistical outlet of the Piscean 12th house into this mix and you can see why my collage is both neat, tidy, latinized (ha! So Virgo!) yet mystical and dreamy (you can read more about the creation of my background artwork here). Next term of Awaken the Divine Feminine starts on April 14th at the upcoming New Moon in Aries . You can sign up for this 4 week course at the Wise Woman University. You can check out more Moon Collages by Divine Moon Musers, Jenn and Claudi here. Elizabeth posted a Moon Collage on her blog - Peace, Joy & Creativity.